The HP Compaq Thin Client t5000 series provides you with a competitive edge through powerful and affordable server-based computing solutions offering desktop performance based on industry standards. 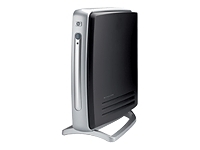 The HP Compaq t5710 delivers mainstream thin client computing in a flexible platform at an aggressive price. Utilizing a standards-based architecture and technologies, the HP Compaq t5710 is a member of the first and only enterprise-ready thin client family. Global experience and server-based computing leadership help make the HP Compaq t5000 series easier to deploy, maintain, and upgrade while offering unprecedented investment protection.